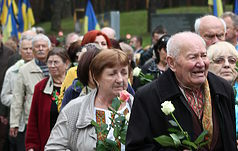 News - National historical and cultural reserve "Bykovnyanskie graves"
On October 6, 2018, the International Scientific and Practical Conference "Places of Memory in the Polish-Ukrainian Dialogue of Mutual Understanding (to the 80th anniversary of the Bykivnia tragedy") was held at the National University of biological resources and nature management of Ukraine. 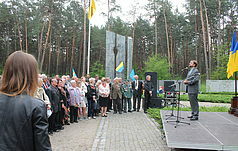 In addition to the university, the event was also organized by the Ministry of Education and Science of Ukraine, the Embassy of the Republic of Poland in Ukraine, the Federation of Polish Organizations in Ukraine, the Institute of History of Ukraine of the National Academy of Sciences of Ukraine and the National Historical and Memorial Reserve “Graves of Bykivnia ”. 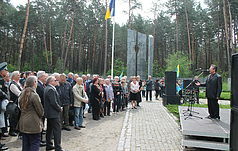 On September 16, 2018 the National Historical Memorial Reserve“Graves of Bykivnia” was visited by MEP, ex-Minister of Foreign Affairs of the Republic of Poland Anna Fotyga, accompanied by representatives of the Polish Embassy in Ukraine and the Military Attache of the Embassy. 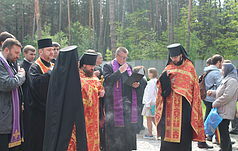 On June 27, a group of 90 Roman Catholic pilgrims from different cities of Croatia visited the National Historical and Memorial Reserve "Graves of Bykivnya". Participation in International Scientific Conference "The Great Terror of 1937-1938"
On June 21-22, 2018, International Scientific Conference "The Great Terror of 1937-1938: Philosophy and Instrumentation, Victims and Performers, Understanding and Historical Memory" was held at Kyiv National Taras Shevchenko University. It united scholars from different cities of Ukraine (Kiev, Odessa, Nikolaev, Rivne, Poltava), as well as Lithuania and Belarus. The scientists of the Reserve attended the Conference.Reports were made by deputy director general of the scientific work of the National Historical and Memorial Reserve "Graves of Bykivnya" Tetyana Sheptytska, Scientific Secretary Valery Filimonikhin, researcher Mykola Bryvko. June 6, 2018 a delegation of French historians - teachers, scholars, students of the History Faculty of the University of Paris I Pantheon-Sorbonne (France) visited the National Historical and Memorial Reserve "Graves of Bykivnya". The group was headed by François-Xavier Nerar, a historian, researcher of the Stalin period, author of the book “Five Percents of Truth. Disclosure and communication in the Stalinist USSR (1928-1941)”. Members of the delegation are members of his scientific and methodological seminar. 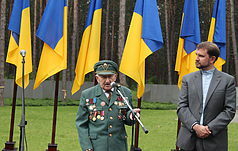 They study topics related to the Second World War, political repressions in the USSR and Europe, the Holocaust, the policy of memory and memorialization, etc. 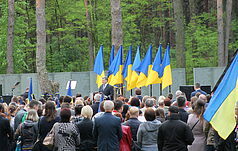 May 20, 2018, commemoration of the victims of political repressions with the participation of the President of Ukraine Petro Poroshenko, representatives of the Government, the Verkhovna Rada, Kyiv City State Administration, the diplomatic corps, relatives of the repressed people and the public took place тon the territory of National Historical and Memorial Reserve “Graves of Bykivnya”. 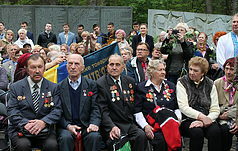 On the secret special stage of the NKVD of the Ukrainian SSR in the Bykivnya Forest, tens of thousands of victims of the "Great Terror" found their last shelter. 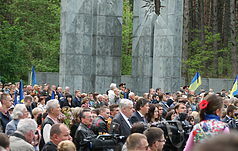 According to historians, the total number of those shot and buried in Bykivnya can amount from 20 to 100 thousand people. Among them there are priests and scientists, peasants and workers, artists and writers, actors and engineers, composers and civil servants. However, it is very important to see behind huge figures individual fates, personal stories and specific names. Graves of Bykivnya are fraternal, but not nameless. COME AND COMMEMORATE EVERYONE! An expanded version of the photo-documentary exhibition "The Word Broken in Bykivnya", prepared by scientists of the National Historical and Memorial Reserve "Graves of Bykivnya" in cooperation with Ukrainian independent publishing house "Smoloskyp" was openes in the premises of the Kyiv City Council and the Kyiv City State Administration on May 20, 2018. On May 15, 2018, the exhibition "Great Terror: Places of Memory" was opened on the sidelines of the Verkhovna Rada of Ukraine. 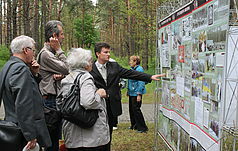 The exhibition was prepared by the efforts of the Ukrainian Institute of National Remembrance, the National Historical Memorial Reserve "Graves of Bykivnya" and the editorial board of the scientific and documentary series of books "Rehabilitated by History». The exhibition consists of 17 banners and tells about the mechanisms of the Great Terror, the legitimization of murders and the geography of the burial places of the repressed Ukrainians.